This article is about Chrom’s appearance in Super Smash Bros. Ultimate. For the character in other contexts, see Chrom. Chrom (クロム, Chrom) is a playable character in Super Smash Bros. Ultimate. He was announced as a newcomer alongside Simon, Richter, Dark Samus, and King K. Rool in the Nintendo Direct on August 8th, 2018. He serves as an Echo Fighter of Roy, though his lack of sweetspots makes him parallel Roy the same way Lucina parallels Marth. Chrom is classified as fighter #25ε. Matthew Mercer and Tomokazu Sugita, who voice Chrom in the English and Japanese versions of Fire Emblem Awakening respectively, reprise their roles in the international and Japanese versions of Ultimate. Both voice actors initially revealed their roles on their Twitter accounts  . Play VS. matches, with Chrom being the 59th character to be unlocked. Clear Classic Mode with Yoshi or any character in his unlock tree, being the seventh character unlocked after Ridley. Have Chrom join the player's party in World of Light. With the exception of the third method, Chrom must then be defeated on Arena Ferox. As the Echo Fighter of Roy, Chrom's moveset and animations are primarily based on those of Roy, and his attributes are identical as well, with excellent overall mobility (very fast dashing, air, and falling speeds, alongside a very effective dash dance) and good frame data for a weapon user. As a result, Chrom shares an almost similar gameplan: he is mainly a rushdown character, who aims to overwhelms his enemy by closing the distance quickly with fast movement. However, Chrom's primary difference is his sword's lack of a sweetspot and sourspot, making him more oriented towards spacing out his opponents at the cost of having lower damage output and knockback up close, compared to Roy (who focuses more on getting up close to his opponent for very hard hits). Chrom also notably lacks any of Roy's distinctive flame effects and reverse-gripped animations, and his forward tilt moves him slightly forward. Finally, Chrom's up special is completely different compared to Roy, as Soaring Slash functions much like Aether compared to Blazer, and is more effective at racking up damage than KOing while onstage; it can even act as a niche sacrificial KO at extremely low percents out of a forward aerial, though this is only effective if Chrom has a stock lead since he is usually KO'd first. Since Chrom's lack of a sweetspot makes his unique attribute similar to his daughter Lucina (who acts as the non-sweetspot/sourspot equivalent of Marth), Chrom's benefits are also somewhat identical to hers: they both share the trait of having the weighted average of their original fighter's damage numbers. As a result, they have more consistent KO and damage potential than their base characters, at the cost of losing out stronger sweetspots that can end stocks early. However, as Roy's sweetspots and sourspots are extremely polarized in power, Chrom's damage and knockback averages end up being higher-than-average, giving him an overall powerful offense. Additionally, he arguably benefits more from his balanced blade than Lucina does, since Roy's weaknesses are his reliance on getting extremely close and extremely ineffective sourspots; as a result, Chrom suffers less from Roy's main flaws, allowing him to both space and fight up close very effectively. Despite his array of strengths, Chrom also has very polarized weaknesses. While Chrom's retention of Roy's high air speed grants him decent survivability with his second jump, his overall recovery is notoriously weak, as Soaring Slash grants almost no horizontal distance and only snaps to ledge once he begins the downward slash, making it susceptible to counterattacks and sufficiently long hitboxes. This, combined with Chrom's low jump height and fast falling speed, results in him having one of the worst horizontal recoveries in the game, and also one of the most easily affected by semi-spikes and gimps. Additionally, he shares similar flaws with Roy: his excellent mobility is offset by a complete lack of projectile-denying tools, making him vulnerable to camping from a handful of characters, and his high falling speed and low air acceleration makes him vulnerable to combos and juggles (though he has some good tools for escaping such combos, such as neutral aerial and falling up aerial). Overall, Chrom is a very accessible and effective character, and provides for a completely different playstyle from Roy despite their shared attributes and moves. His aim is to strike a balance between aggression and patience, as he has the mobility, range and damage necessary to switch between gameplans on the fly. Because of his strengths, Chrom has been viewed extremely positively in the early competitive scene since the release of Ultimate, and is a popular secondary pick for many high-level players, including komorikiri. Additionally, because Chrom's lack of Roy's sweetspots and flame-based attacks spreads across his entire moveset, and his up special makes his offstage presence much less safe for both Chrom and his opponent(s), Chrom is generally considered to be one of the most unique Echo Fighters, alongside Ken and Lucina. As such, they are not expected to share a spot on the tier list, and are expected to be allowed to be used with their base fighters in Squad Strike. As with all other Echo Fighters, Chrom has different taunts and victory animations. Chrom has a different idle stance and slightly altered idle poses, with his left arm lifted, his sword pointed downward, and noticeably less bouncing. However, this does not apply when holding a light item. Chrom's sword trails are blue and white, and do not fade out, making them identical to Lucina's. Chrom has an additional voice clip for taking light knockback, an alternate KO voice clip, and a voice clip when performing a tech and emerging from underwater. As of the 3.0.0 update, Chrom has a distinct victory theme from Roy, shared with Lucina and Robin based off of "Id (Purpose)" from Fire Emblem Awakening. However, in prior versions, Chrom and Roy shared the same victory theme. Unlike Roy, all of Chrom's attacks lack a flame effect and instead have a wind/slash effect. Chrom's Falchion lacks a sweetspot and sourspot compared to Roy's Binding Blade. As a result, it always deals consistent damage and knockback throughout, like Lucina's Parallel Falchion. Chrom has more effective reach than Roy, as Roy cannot take advantage of his long reach due to his weak sourspots. Chrom cannot secure KOs as early as Roy can. Chrom lacks the combos and KO setups that Roy's sourspots grant. Unlike Roy, Chrom does not hold his sword in a backward grip for his neutral attack, forward tilt and up tilt. This marginally alters the hitbox placements of those moves. Chrom has a set voice clip for all three of his smash attacks. Chrom's neutral attack has more horizontal range due to an altered animation where Chrom doesn't bend his elbow as much. Chrom's forward tilt moves him slightly forward unlike Roy's variant. This effectively increases its range. Up smash has drastically less hitlag, making it harder to DI correctly. Chrom's neutral special, Flare Blade, functions identically, but has different visuals and sounds. Instead of charging up with flames for a fiery explosion, Chrom's sword charges with a wind effect before it unleashes a yellow shockwave. Additionally, as the move is charged, Falchion's blade slowly sparkles from the blade's base to the tip, while dust and debris kick up around Chrom. Chrom has a unique up special, Soaring Slash, which resembles Ike's Aether. Unlike Aether, where Ike throws his sword first, Soaring Slash has Chrom launch his opponent upward with his sword before performing an upwards slash, resembling a move Chrom performs in the "Two Falchions" cutscene of Fire Emblem Awakening and a move he can perform in Fire Emblem Warriors. Like Aether, Soaring Slash grants Chrom super armor before he leaps upward. Soaring Slash deals more damage compared to Blazer, and Chrom can also perform a sacrificial KO, although this is situational due to him getting KOed first. Soaring Slash offers almost no horizontal distance compared to Blazer. As a result, Chrom is worse at edgeguarding, and his offstage survivability is significantly worse. Compared to Roy's Blazer, Chrom's Soaring Slash does not have intangibility on frame 9 and its super armor does not start until frame 10 (compared to Blazer's super armor starting at frame 4). However, Chrom's super armor lasts significantly longer (6 frames → 20). Soaring Slash's first hit comes out one frame slower than Blazer's (frame 9 → 10). Chrom has different quotes for a successful Counter, and only has two compared to Roy's three. He may either say "Not today!" or "No way!" Chrom's Counter launches opponents further, KOing slightly earlier than Roy's. Chrom has a unique Final Smash called Awakening Aether, inspired by Aether's portrayal in Fire Emblem Awakening. Awakening Aether has increased knockback compared to Roy's Critical Hit, allowing it to KO opponents sooner in comparison. Awakening Aether has more effective range due to Chrom dashing forward. However, the move can only catch up to two opponents. The properties of Soaring Slash have been altered. Soaring Slash's meteor smash hitbox has reduced knockback. Additionally, the move has slightly increased fall speed now KOing Chrom first when used in a sacrificial KO, rendering it useless against opponents on their last stock unless he has more stocks than them. Down aerial auto-cancels earlier (55 → 52), matching the move's interruptibility. Chrom's victory theme has been corrected. He now shares the remix of the Fire Emblem Awakening song "Id (Purpose)" with Robin and Lucina. Chrom's overall damage output is close to the weighted average of each of the hitboxes of Roy's attacks. 6.5% An upward slash. A great combo starter, due to launching at a rather high angle and having low knockback and ending lag. It can easily start combos into a grab, tilts, aerials, or Double-Edge Dance. 10.925% A downward slash. Powerful for a tilt considering its speed. Unlike Roy's forward tilt, it moves him slightly forward. 10.45% A overhead arcing slash. 9% A kneeling thrust, identical to Marth and Lucina's down tilt. 12% An inward horizontal slash across the ground. Very strong for a dash attack, KOing at around 130% near the ledge. However, it has noticeable startup and ending lag, which makes it very unsafe on shield. 18% Rotates his body to perform a lunging, two-handed downward slash. Has high ending lag and a short duration, but hits hard for its speed and is a good punishing tool. 1% (hit 1), 2% (hits 2-4), 10% (hit 5) An upward thrust, which surrounds the Falchion's blade with wind and concludes with a small explosion. A good anti-air attack, as Chrom's sword arm is granted intangibility throughout the attack (frames 10-23), though mediocre for ground combat due to it having small horizontal hitboxes. Has enough power to KO at around 100% uncharged. 12.35% (front hit), 14.25% (back hit) A kneeling outward slash in front of himself and then behind himself. Chrom's fastest smash attack when it comes to startup, but has the highest ending lag of the three and is weaker. The back hit is stronger than the front hit. 4.75% (hit 1), 6.65% (hit 2) An inward slash followed by a spinning, outward slash. The first hit can start guaranteed combos, though it can be difficult to setup due to how fast it ends. 9.025% A downward slash. Very quick, auto-cancels in a short hop, and has KO potential at high percentages. It can also be used in quick succession due to its low ending lag, making it possible to perform a wall of pain. 10.925% Rotates his body to perform an upward slash. Interestingly, it turns Chrom around completely, similarly to Marth and Jigglypuff's back aerials. Has great KO potential at high percentages. 7.6% A backflipping, upward arcing slash. Useful for juggling, and can even KO at very high percentages. 11.85% (sourspot), 14.25% (sweetspot) A two-handed, downward slash between his legs, similar to Ike's down aerial. Has the capability to meteor smash when sweetspotted (making this Chrom's only attack with a sweetspot and a sourspot). Unlike Roy's version, it lacks flame hitboxes. 1.2% A knee strike. A fairly fast pummel. 6% Heaves the opponent upward with his free hand. Chrom's only throw with KO potential, starting around 170%. 5% A one-armed body slam. Chrom's only combo throw and is very reliable due to the amount of followups it can potentially set up into. However, it has very low hitstun. 10% Performs an outward slash while climbing up. Flare Blade 8% (uncharged), 50% (fully charged), 10% recoil (fully charged) Rears back and charges the Falchion in wind before performing a lunging, two-handed downward slash that generates a yellow wind/slash shockwave. Despite its visual appearance and sounds, it functions identically to Roy's variant. As it charges, the Falchion will also slowly glow with a blue sparkle from the hilt to the tip. Like with Roy, Chrom can turn while charging the move. Functions similarly to Eruption, as it can be charged before unleashing the explosion, with the shockwave's size growing as it charges. It has very high knockback growth even while uncharged, and the ability to quickly increase its damage output via charging. When fully charged, it will OHKO every character in the game, with the exceptions of Bowser from center-stage and Shulk in the Shield Monado Art. Double-Edge Dance Varies (see below) A sequence of sword slashes with several variations based on directional input. Four slashes total, with each capable of being altered in direction, allowing for eighteen total possible combinations. Standard strikes are trailed red, high strikes are trailed blue, and low strikes are trailed green. As with Roy, its overall knockback is slightly stronger than Dancing Blade. Unlike Roy's version, however, the last hit of each variation lacks flame hitboxes, and as each hit deals equal damage throughout the entire blade, it is effectively a stronger version of Lucina's Dancing Blade. Soaring Slash 6% (hits 1, 4 and 5), 1.5% (hits 2 and 3) Chrom performs a slash upwards, and then jumps with his sword still in hand, twirling in the air before coming back down. Similar to Ike's Aether, but without tossing his sword, making it more similar to Final Cutter, but without a projectile as Chrom lands. Just like Aether, Chrom gains super armor just before the leap (frames 10-30). Compared to Roy's Blazer, it deals more damage, but offers very little horizontal distance. In earlier versions, it was infamous for being able to quickly and efficiently end stocks in the form of a sacrificial KO. However, it was nerfed significantly in 2.0.0 so that it now KOs Chrom first. As such, the move is situational, and is only useful for that purpose when Chrom has more stocks than his opponent. Counter 1.35× (minimum 9%) Parries and then counterattacks against any incoming attacks with an outward slash. As with Roy, it has a 1.35x damage multiplier. Awakening Aether 1% (dash), 10% (hit 1), 36% (hit 2) Chrom lunges forward, yelling "Anything can change! ", "Now I'm mad!" or "Your end has come!" as he slashes with his sword. Any opponent(s) that he hits with it will be caught. After the opponent(s) have been caught, the camera angle changes to resemble that of attacks in Fire Emblem Awakening. Chrom then attacks the trapped opponent(s) again with a more powerful sword strike, sending them flying. Compared to Roy's Final Smash, it is stronger in terms of knockback, and can KO at earlier percentages in comparison. First Hit (Neutral) 2.85% Does an outward slash. Deals very little knockback even at extremely high percents. Can jab lock. The tipper lifts opponents off the ground slightly, making it combo into the second hit more consistently. Second Hit (Up) 2.85% An upwards lifting slash. Has greater vertical reach than the first hit or the second neutral hit. Lifts opponents slightly off the ground, with the tipper hit pulling them in slightly. Third Hit (Up) 3.75% Does an upwards slash while turning clockwise. Launches opponents slightly up and away, leading into the upward finisher. Third Hit (Neutral) 3.75% Takes a step forward and does a leaning outward slash. Third Hit (Down) 3.75% Leans in and does a horizontal slash low to the ground. Fourth Hit (Up) 6.4% Twirls counterclockwise and does an upward slash. Launches opponents up, making it useful for starting juggling strings. Has the least ending lag of the three finishers. Fairly low knockback. Has greater vertical reach than any other hit of the move. Fourth Hit (Neutral) 5.2% Turns counterclockwise, steps forward, and does very powerful vertical slash downward. This is the strongest finisher in regards to knockback, KOing middleweights near the edge by itself around 115%. Fourth Hit (Down) 2% (hit 1-4), 4.2% (hit 5) Does a flurry of five lower stabs. Deals the most damage of the three finishers, wearing down shields well, and can shield poke low shields. Has the highest ending lag of the three finishers. Warps onto the stage using warp magic while crouching, with Falchion stuck in the ground when he appears. Chrom then pulls it out with a flourish before assuming his idle stance. Up taunt: Looks at the screen as he twirls Falchion twice, then assumes a stance highly similar to his pose from his official art in Fire Emblem Awakening, saying "Come at me!" (かかってこい！, Come at me! Down taunt: Twirls Falchion twice, then holds the blade of the sword on his left hand as he finishes, saying "I will not fail!" (俺は負けん！, I won't lose!) This was one of his battle quotes from Awakening. Briefly clenches his left fist. Holds Falchion upwards and parallel to his body, while lightly rubbing its edge. In any victory pose, there is a chance Chrom will say "Our bond is stronger than steel." (いつでも稽古をつけてやる, We can practice anytime.) if Lucina was present during the match. Swipes his sword twice and twirls it before posing with his sword in front of himself, while saying "Anything can change!" (運命を変える！, Change destiny!). Based on his and Lucina's trademark pose, which they frequently use in official art. Rushes forward, performing an upwards slash, before twirling his sword and posing while pointing his weapon towards the camera, saying "Training paid off!" (いつでもかかってこい, Come at me anytime.). Based on Awakening Aether. Performs an outward slash, twirls his sword, then plants it into the ground before posing, saying "I will cut a path!" (俺が道を切り拓く！, I will cut a path!). Based on his victory pose in Fire Emblem Awakening. Blank - Placed 33rd at Glitch 6 and Frostbite 2019. MattyG - Placed 13th at Let's Make Moves and 65th at GENESIS 6. Mr.R - Placed 4th at Ultimate Nimbus. RAIN - The best Chrom player in Japan. Placed 17th at Umebura SP and 33rd at Umebura SP 2. Shoyo James - Currently considered to be the best Chrom player in the world. Placed 2nd at Suplex City Smash, 7th at NYXL Pop-Up!, 9th at Frostbite 2019, 13th at Glitch 6, and 25th at Let's Make Moves. Tweek - Formerly the best Chrom player in the world. Chrom fights mainly in team battles, in homage to Awakening's Pair Up system, with the exception of the first round, which instead recreates his duel with Lucina in Chapter 4 of Awakening. 2 Fox and Falco Lylat Cruise Space Armada Lucina is a CPU ally. 3 Ness and Lucas Onett Pollyanna (I Believe in You) Female Robin is a CPU ally. 4 Donkey Kong and Diddy Kong Jungle Japes Jungle Hijinks Lucina is a CPU ally. 5 Peach and Daisy Mario Circuit Rainbow Road - Mario Kart: Double Dash!! Male Robin is a CPU ally. 6 Simon and Richter Dracula's Castle Vampire Killer Lucina is a CPU ally. Final Master Hand and Crazy Hand Final Destination Master Hand / Crazy Hand Female Robin is a CPU ally. Although Chrom does not appear in the World of Light opening cutscene, he was vaporized and later imprisoned alongside the rest of the fighters (sans Kirby) when Galeem unleashed his beams of light. Chrom was one of the many fighters that fell under Dharkon's control upon Galeem's first defeat. He is in a desolate part of the Triforce of Courage section of the Sacred Land sub-area. The only way to reach him is by finding a treasure chest and jumping in it once opened in order to be transported to his location. This is hinted by an Owl Statue in the right path of the Triforce of Power section. Chrom's Fighter Spirit can be obtained by completing Classic Mode. It is also available periodically for purchase in the shop for 500 coins. Unlocking Chrom in World of Light allows the player to preview the first spirit below in the Spirit List under the name "???". As a Fighter Spirit, it cannot be used in Spirit Battles and is purely aesthetic. Each Fighter Spirit has an alternate version that replaces them with their artwork in Ultimate. •Defeat an army of fighters ST01: Roll Out, Wonderful 100! Chrom standing on Palutena's Temple. Chrom using his Double-Edge Dance on Ganondorf in Arena Ferox. Chrom standing on Suzaku Castle. Chrom's Double-Edge Dance on Skyloft. Chrom with Super Leaf equipped surrounded by sleeping Wolf, Lucario and Fox on Living Room. Chrom's red costume and Female Robin on Coliseum. Chrom struck by Piranha Plant's neutral special on Halberd. Chrom and Dark Samus on Skyloft. Chrom attacking Luigi on Garden of Hope. In Robin and Lucina's reveal trailer for Smash 4, a defeated Chrom remarks that he'll "get [his] chance another day". This later became true with his playable appearance in Ultimate. Chrom is the second character to become playable after previously being featured in a Final Smash, the first being Palutena, who appeared in Pit's Final Smash in Brawl, Palutena's Army. Unlike Palutena however, Robin still summons him during his Final Smash. Chrom is the second newcomer in Ultimate that was previously featured as a Mii Fighter costume in Super Smash Bros. 4, after Inkling and followed by King K. Rool and Isabelle. He is also the only Echo Fighter to have been featured as a fully-fledged Mii outfit in Super Smash Bros. 4. In SSB4's Palutena's Guidance, Viridi teases Chrom for being too similar to Ike, calling him a "carbon copy". 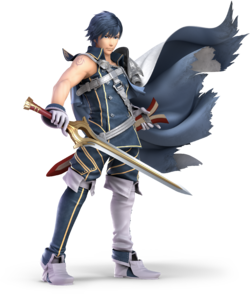 Although Chrom is an Echo Fighter, his moves are instead derived from a different Fire Emblem fighter, Roy. Additionally, Palutena mocks Chrom's lack of an Aether recovery move, but he gains the ability to use such a move in Ultimate, and is able to use it as a skill in Fire Emblem Awakening. Chrom is the first Echo Fighter of a semi-clone (Roy), and the first Echo Fighter that borrows moves from more than one character; in this case, both Ike and Roy. Chrom is the first Fire Emblem newcomer since Marth to not be from the latest Fire Emblem game at the time. Due to an error on the official site, Chrom's character showcase video was not visible on the mobile variants of the main page, and was barely visible on the desktop version. Strangely, the video was still visible when going into his blog post. This has been fixed. According to Sakurai's weekly Famitsu column, Chrom was added due to his popularity in Japan, while Dark Samus was added due to her popularity overseas. Chrom's classic mode references the Pair Up system in Fire Emblem Awakening, in which two units can team up to deal additional damage to an opponent. Chrom's teammates in this mode are Lucina and both versions of Robin, all of which come from the same game as him. Additionally, Chrom's first battle is against Lucina in Arena Ferox, referencing their fight in Chapter 4 of Fire Emblem Awakening. Chrom is the only character who travels to Mario Circuit in Classic Mode. Chrom will revert to Marth's idle animation while holding a small throwable item. This is a trait shared with Roy. Chrom may occasionally yell "Sorry!" when KO'd. He is one of the few characters that speak during a KO. Chrom is the only Echo Fighter who is not unlockable in the same Classic Mode unlock column as the original fighter (Roy is in Mario's, Chrom is in Yoshi's). However, he is in the same unlock column as his ancestor, Marth (who Roy is a semi-clone of) and his daughter, Lucina. Chrom has an additional voice clip in one of his victory poses. Against Lucina, he has a chance to say, "Our bond is stronger than steel." Unlike most character-exclusive victory clips, this one can be heard in the Sound Test. Chrom's sword and sheath are absent in his "Defeated/No Contest" animation. This oddity is shared with Roy. His sheath is also missing during his on-screen appearance as well. Chrom’s third victory animation (where he plants the Falchion into the ground) is played in the opening movie on the Bridge of Eldin rather than Battlefield. This is likely a developer mod that was used exclusively in the opening for thematic purposes. The final hit of Chrom's up smash has a similar sound effect to Fox Illusion and Falco Phantasm's dashes in Melee. Likewise, the charging sound for Chrom's version of Flare Blade is comparable to the sound for charging copy abilities in Kirby's Return to Dream Land. When freeing a spirit from its puppet fighter after winning a spirit battle on the Spirit Board, Chrom does not hold the Falchion nor does it appear sheathed. Prior to the 3.0.0 update, Chrom was the only Fire Emblem Awakening fighter representative that did not have the distinct victory theme based off of "Id (Purpose)", and used the default Fire Emblem victory theme instead. As a result of this change, Chrom is the first (and so far, the only) character to have their victory theme changed through game updates. This page was last edited on April 19, 2019, at 16:56.